This sample Excel VBA code from Bob Ryan, of Simply Learning Excel, formats the first pivot table on the active sheet. 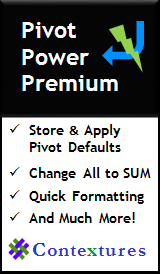 For the data field(s) in the Values area, changes the setting to Sum, changes the number format, and if the field in the Values area is named "Amount" ot "Total Amount" it shortens the label in the PivotTable to "Sum Amt" or "Sum TtlAmt" respectively..
Watch the Format Pivot Table in Classic Style macro video to see the manual formatting time, compared to running the macro.
' if the field in the Values area is named "Amount" ot "Total Amount"
'          in the PivotTable to "Sum Amt" or "Sum TtlAmt" respectively.
' that are not currently in the PivotTable.
' but only if the field is named "Amount" or "Total Amount"
Download the Format a pivot table in classic style sample file. The file is zipped, and in Excel xlsm format.